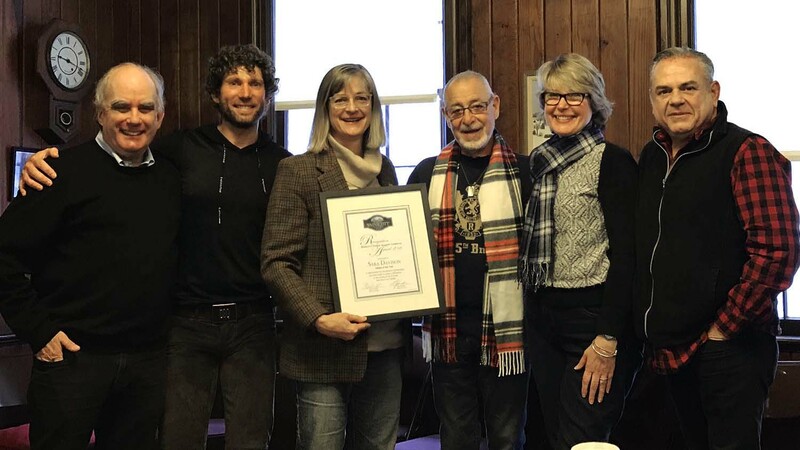 The Friends of Georgica Pond Foundation, Inc. announced today that their Executive Director, Sara Davison received the “Citizen of the Year” award from the Wainscott Citizens Advisory Committee (WCAC). The award was presented at the regular meeting of the WCAC at the Wainscott Chapel. Davison was cited for her work on the Wainscott Hamlet Study, the Wainscott Business Moratorium and her efforts to protect Georgica Pond. Left to right: WCAC co-chair Barry Frankel, Simon Kinsella, Sara Davison, Rick Del Mastro, East Hampton Town Councilwoman Kathee Burke-Gonzalez & WCAC co-chair Jose Arandia. Photo by Bruce Solomon.